A Science Museum Where Learning is F-U-N! Just think about anything science and it's there at the Ontario Science Centre! 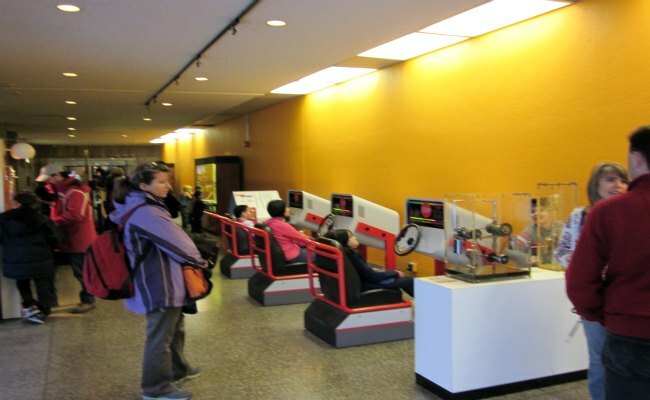 The ground-breaking science museum in Toronto features large number of hands-on exhibits and activities for kids and adults alike who want to learn while having some fun. Whether it's space, physics, psychology, nature, human body or forensics science - there are a number of creative and unique displays representing each branch of science. 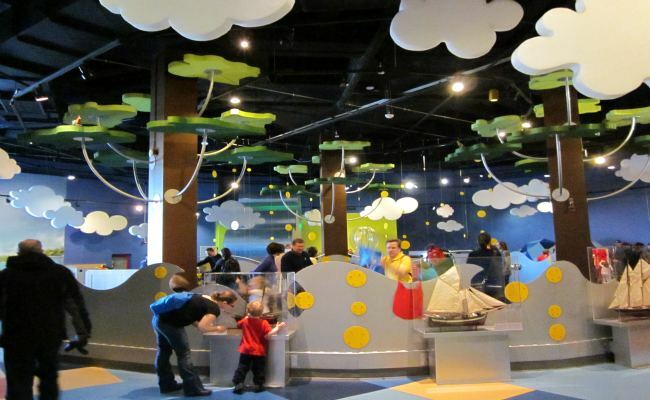 Unlike most museums around the world, the Ontario Science Centre (OSC) encourages you to interact with the exhibits in variety of ways. You can touch, push, pull and experiment with the exhibits. 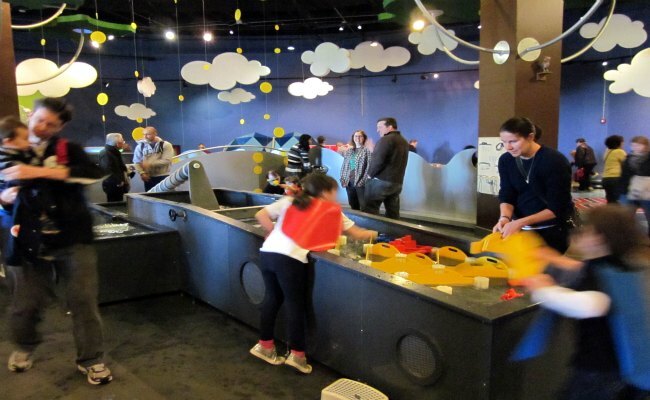 With more than 800 exhibits and demonstrations, the OSC fuels your imagination, promotes innovative thinking and simultaneously provides a lot of fun. At the OSC, you can wander through a real Rain Forest environment, test your reflexes, pilot a rocket chair, examine a human skeleton and other organs, and challenge your brain with variety of puzzles, games and illusions and much more. The OSC also features many temporary exhibits, special events, live demonstrations and IMAX films. And this unique museum is housed in equally matchless building. Built along the Don River ravine, the Ontario Science Centre consists of three descending buildings connected by a series of bridges and escalators. And it's only after you've got into in the Centre, you realize the innovative design of entire structure. Since its opening in 1969, the Ontario Science Centre has attracted more than 40 million curious visitors with its amazing collection of scientific wonders. The OSC consists of 8 permanent exhibition halls, a few special exhibition halls and OMNIMAX theatre. Let's explore various exhibition halls. Are you fascinated with outer space and its countless objects? Then check out the newly renovated Space hall and discover the Sun, Moon and planets of our solar system. 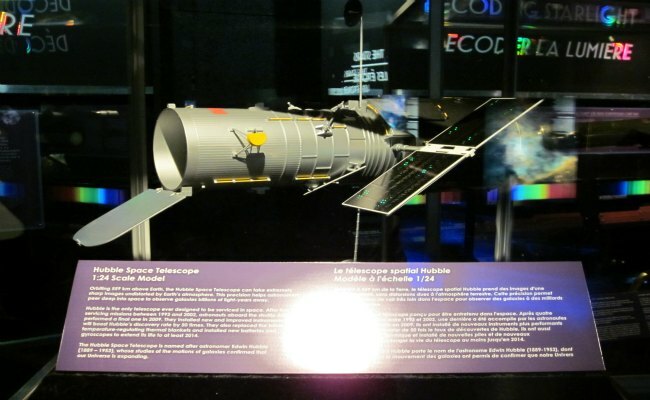 The Space hall features an impressive collection of meteorite and other celestial bodies. Here you will find real rocks from the Moon and Mars. Don't miss to pilot a rocket chair. 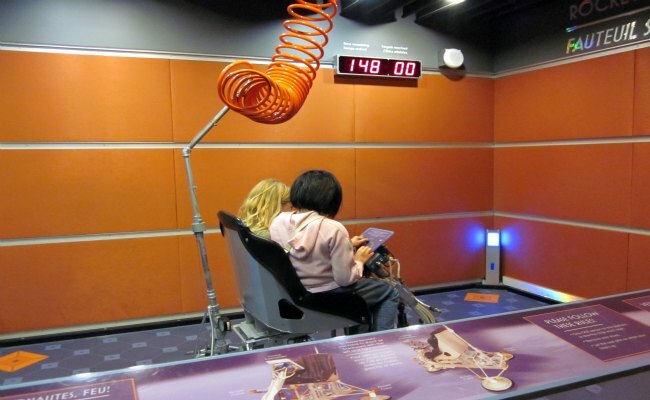 This exhibit allows you to ride and control a rocket chair. Really exciting! You can learn how astronauts float in the space, unlock other mysteries of space, explore the galaxies, and see real model of Hubble telescope and other astronomical instruments. The Space hall also features modern planetarium where you can enjoy several amazing shows. Check out the show time and line-up early, the space is limited. KidSpark is a learn-through-play area specially designed for kids eight and under to enjoy with their parents. The KidSpark is so popular that it was expanded and doubled in size just after 2 years of opening. It offers lots of fun-filled activities to keep your kids occupied for hours. It features Water play area, where kids pour, splash and drip water. It's amazing to discover how water behaves when its flow is blocked. Children can build a roller coaster and float balls in mid-air. Or create shapes, colours and patterns using magnets, mirrors, a pin wall and puffs of water vapour. Kids can also enjoy cooking in a mini-kitchen or listen to a story in the reading room. There is studio where kids can perform, sing or make wonderful music. Visit the Living Earth hall and get hands-on with nature! It features wide array of amazing natural exhibits. Here you can experience the real rain forest environment. 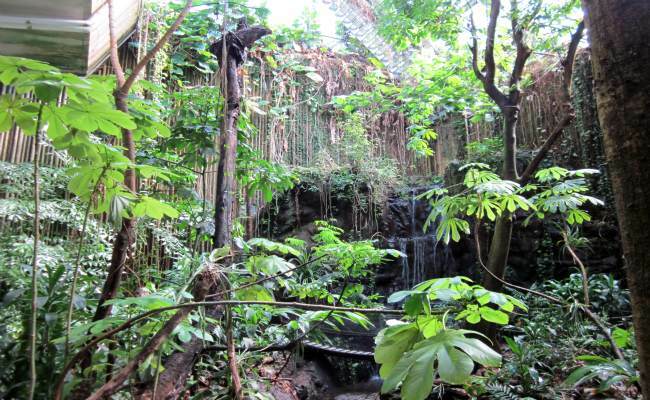 The hot and humid Rain Forest exhibit is filled with plants and animals. Explore the coral reef eco system to learn about its wonderful inhabitants, check out a real whale skeleton or experience the tornado tunnel and limestone cave. One of the interactive exhibits allows you to taste the drinking water and compare your results with other visitors. The other major exhibits feature jumbo sized cockroach, Poison Dart frog, various fishes, beetles and much more. If you want to learn how different parts of human body work, check out the Human Body exhibit hall. 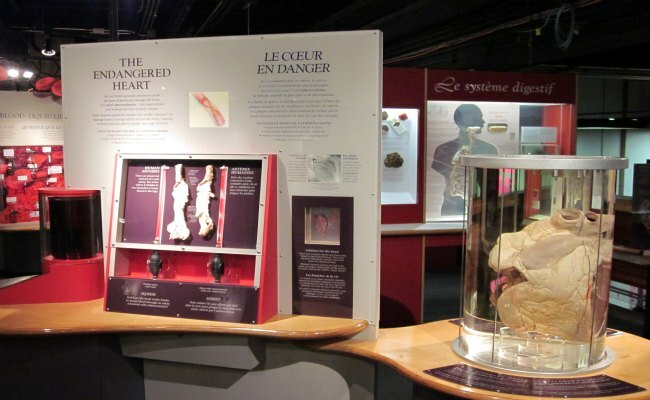 Here you can examine a human skeleton and various internal organs like heart, lungs etc (some of them are real). You can also learn about different blood groups and how blood is stored in blood banks. Discover what you will look like in future with the aging machine, find out about human reproductive system or analyse the colour of your spit. Learn how DNA analysis helps forensic experts to identify criminals and much more. 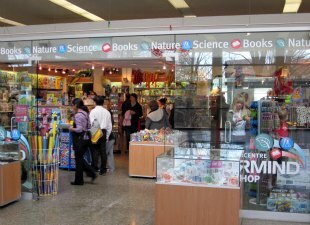 The visitor favourite Science Arcade is full of puzzles, games, illusions and challenges. Here you can explore the soundproof tunnel, catch your shadow in the light tunnel or test your dexterity by doing some simple tasks backwards in a mirror. You can pedal a bicycle generator to power a video camera and display monitor. Also, don't forget to test how fast you can react by hitting the brakes at the abrupt STOP signs! The MindWorks (Communication) section is ideal for youths and adults. The exhibits in this hall give a lot of insight into the human mind and its working. You can explore the complexities of human communication, check you problem solving skills and test your memory through various exciting activities. Check whether you can pick the right suspect out of a line-up after witnessing a crime. The OSC features several exciting and educational demonstrations in various exhibition halls. 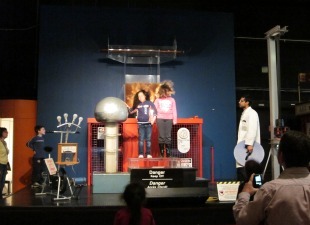 Check out "What's watt" and have a wonderful hair-raising experience and a new hairdo with the famous Van de Graaff generator at the Electricity Demo. The other popular demo is Papermaking Demo, where you can see process of making paper by hand, how cloth and plant products are used to make a paper and how paper is recycled to conserve environment. Visit the Communication Hall to see the Jacquard Loom and learn how patterns are programmed into it by a stack of punch-card. Check the demonstration times to make sure you don't miss something very interesting. IMAX Dome theatre is another major attraction at the Ontario Science Centre. The 320-seat capacity theatre features a screen 4,500 times bigger than a TV screen with six-channel sound produced by 44 speakers. 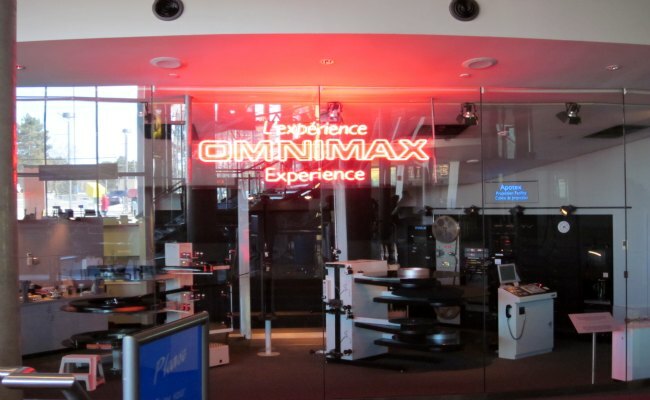 You can enjoy some exciting and educational IMAX films with friends and family. Check out the show times and what's playing on the day of your visit. Admission to IMAX theatre is not included in general admission ticket. The Mastermind gift shop offers variety of educational books, stationary, toys, games, gifts and much more. Buy a perfect souvenir to keep the thrilling reminiscences of the museum always intact. The Ontario Science Centre has restaurants offering wide selection of food to satisfy everyone's tastes. The Valley Market Place restaurant, located on 6th level features a lip-smacking collection of cuisine. You can enjoy pasta, stir fry, burgers, hot dogs, fries, onion rings and varieties of salads and sandwiches. Or relish the freshly made pizza at the Pizza Pizza. If you are looking for healthy options, you can choose from fruit salad and yogurt parfaits. The restaurant also offers huge selection of hot and cold beverages, including Starbucks coffee, juices and milk. The Lobby Cafe and Great Hall Kiosk offer large varieties of healthy and fresh sandwiches, snacks, salads, yogurt parfaits, pastries along with a wide assortment of hot and cold beverages. The Ontario Science Centre is open every day of the week throughout the year including all public holidays, except December 25 (Christmas Day). 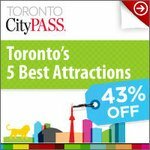 From the Union Station in downtown Toronto, take the Yonge Street subway line north to the Eglinton Station at Yonge St. and transfer to the Eglinton East (route 34) bus. Get off at Don Mills Road. Or, take the Bloor-Danforth subway line east to the Pape Station and transfer to the Don Mills (route 25) bus. Get off at St. Dennis Drive, right in front of the Science Centre. From the West - Take Highway 401 E to the Don Valley Parkway South. Exit at Eglinton Avenue E and then head west until you reach Don Mills Road. Then turn left on Don Mills Road and follow the signs! From the East - Take Highway 401 W to the Don Valley Parkway South. Exit at Eglinton Avenue E and then head west until you reach Don Mills Road. Then turn left on Don Mills Road and follow the signs! From the South - Take QEW/Gardiner Expressway E into Toronto. Take the Don Valley Pkwy North and exit at Don Mills Road North and then follow the signs! From the North - Take Highway 404 South to the Don Valley Parkway South. Exit at Eglinton Avenue E and then head west until you reach Don Mills Road. Then turn left on Don Mills Road and follow the signs! Parking: On-site parking is available at the Ontario Science Centre. Parking charge is flat $10.00 per vehicle. Cash only.